An abbreviated family tree. Technically, the Pandavas are also Kauravas. But, they are rarely referred to that way. "Arjuna." "Sanjaya." "Krishna." "Dhritarashtra." If you do not remember these names, now is a good time to review them. For, as we prepare to read more lines and verses from the Bhagavad Gita, it helps to know just a little more of the story. The Bhagavad Gita is one part of the massive epic poem known as the Mahabharata (mahābhārata, "The great lineage of Bharata."). It makes cursory reference to the many ancestors and forefathers of the warriors on the battlefield, and for that reason, a bit more knowledge about the story will make the process of reading the Bhagavad Gita much easier. Both Arjuna and his many cousins are descendants of an ancient king called Kuru (kuru), who gives his name to the battlefield known as Kurukshetra. Many generations after Kuru, two brothers are born: Dhritarashtra, whose name we've already seen, and Pandu (pāṇḍu). These two kings are the fathers of the men on the two sides of the battlefield. Although Dhritarashta is the older of the two brothers, he is blind and therefore deemed unfit to rule. For that reason, his brother Pandu takes the throne. But the details of that are not relevant here. What is relevant, however, is that Pandu has five sons, collectively known as the Pandavas (pāṇḍava. 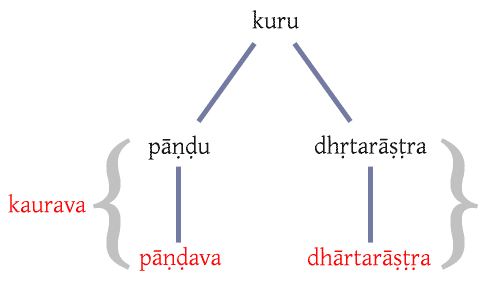 Note that the word pāṇḍava forms from an ordinary secondary suffix and means something like "coming from Pandu.") These five brothers inherit their father's kingdom and rule it well. Arjuna is the third of the five sons. But we must consider the hundred sons of Dhritarashtra as well. These sons are sometimes called the dhārtarāṣṭras for their father but are usually called the Kauravas (kaurava, from kuru) for their royal ancestor. For the whole of their life, the hundred sons of Dhritarashtra have envied the sons of Pandu for their inheritance, their skill in battle, and so on. The eldest of these sons, named Duryodhana (duryodhana), contrives a plan to take the kingdom back and shame his cousins forever: he wins the kingdom in a rigged dice game with the eldest Pandava. The terms of the agreeement are that the Pandavas will go into exile for several years before they can return and continue to rule. Yet when the Pandavas return to the land after these years have passed, Duryodhana refuses to grant them even a place to stand. The Pandavas are outraged, and war erupts. Thus the Pandavas fight their Kaurava cousins. Armies from around the world flock to the two sides. Krishna is cousin to both sets of brothers, but for various reasons he sides with the Pandavas. Dhritarashtra, being blind, cannot see the batte. Therefore he consults his minister Sanjaya, who has been blessed with divine sight, to relay the events of the war. This is the most common meaning of jāla. The derivation of this word is unknown. It is assumed to be irregularly formed from the root above. The leonine hero becomes dispassionate. The hostile lion goes to the state of dispassion. The warriors strike the boys. I walk to the village for your (singular) net. My grandson sees a fruit in the rural forest. The tools of Sanskrit word formation let us create compact, rich, and abstract words that do not have many peers in English. I do not mean that English cannot express ideas like vairāgya. Rather, I mean that such ideas require messier translations, like "the state of dispassion" or "passionlessness." Because of this quality of many Sanskrit words, these "English to Sanskrit" exercises will soon become less useful. Therefore, future exercises will tend to emphasize translation from Sanskrit much more. But until then, we should continue to grow our vocabulary and practice with simpler exercises from English to Sanskrit.